John Lennon UFO sketch 'a fake' claims star's former girlfriend May Pang. Beatles Radio: The Beatles, Solos, Covers, Birthdays, News The Fab 4 and More! But Berwyn Mountains flying saucer investigator Russ Kellett insists the drawing of an encounter Lennon had with a flying saucer in New York is genuine. The former girlfriend of John Lennon is reported to have claimed a rare drawing of a UFO by the Beatles legend, acquired by an expert on one of North Wales’ greatest mysteries, is a fake. Russ Kellett, is known for investigating the 1974 UFO Berwyn Mountains incident involving theories of an extraterrestrial craft crashing in the area. 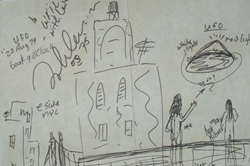 Mr Kellett said a few months ago he bought Lennon’s sketch of an encounter he had with a flying saucer in New York - the same year as the North Wales incident.